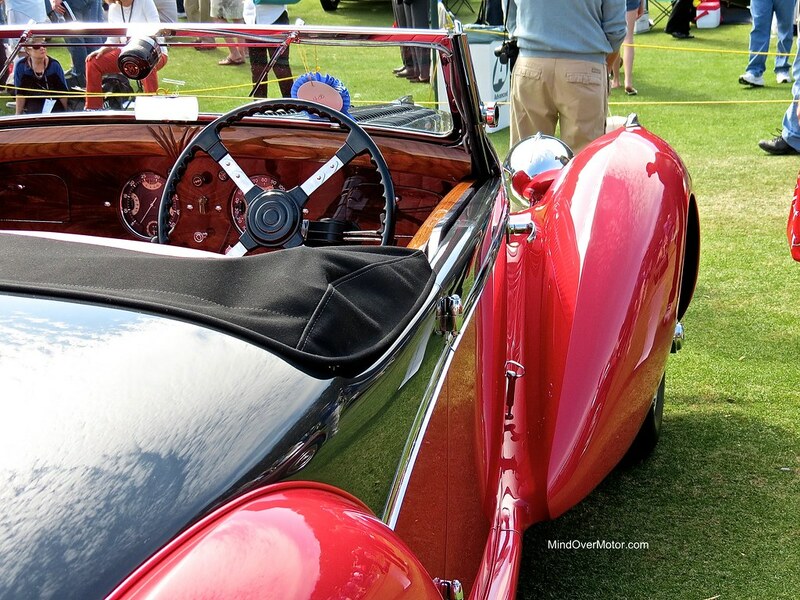 Here is part 2 of our highlights from the 2014 Pebble Beach Concours d’Elegance. 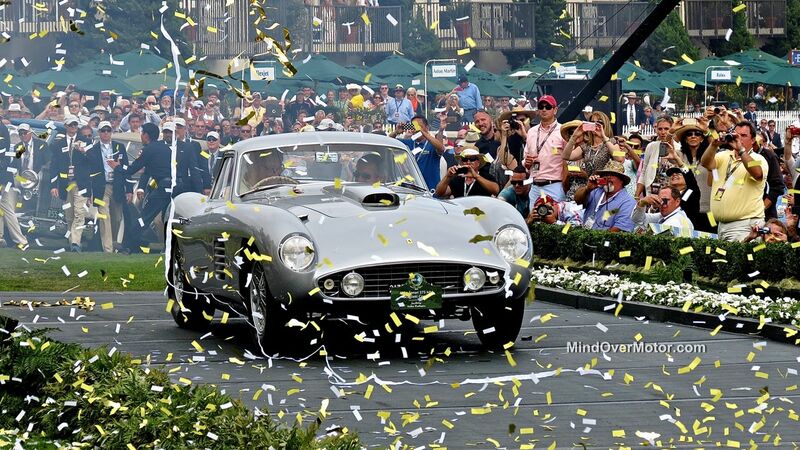 This was the first time a Ferrari has ever won best in show (see above), as well as a very uncommon occurrence where a post-war car takes the top honor. Enjoy the photos of these incredible cars! We made it out to The Elegance at Hershey 2014 in Hershey, PA where Hershey’s chocolate is made. It is a great event at a wonderful venue, the five star Hershey Hotel. 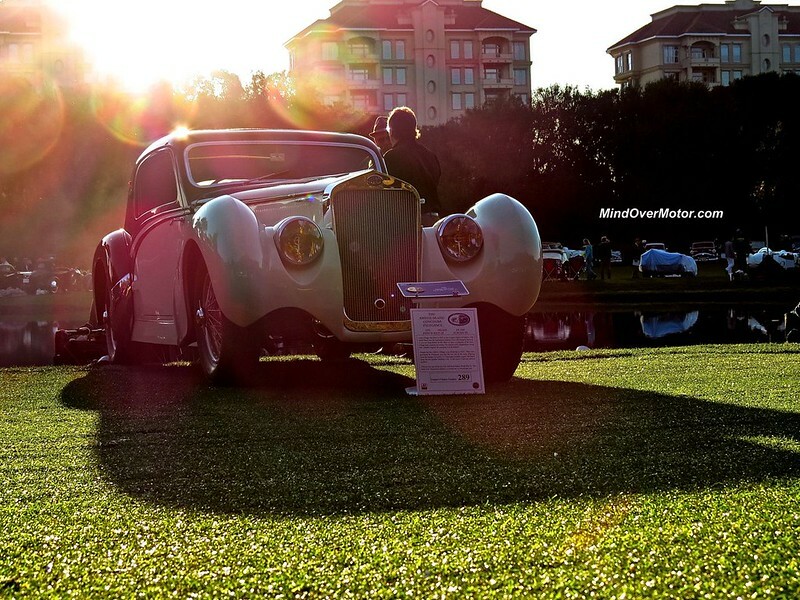 With beautiful gardens and fountains supplementing all of the stunning cars, it is surely a great place for photos. There were many rare cars this year, everything from a French-market Cadillac built for the Rothschild family to the best-in-show winning Duesenberg “Mormon Meteor” Speedster. Enjoy the highlight gallery of the event and check back for features on some specific cars. Those of you who’ve been following this blog will know that I LOVE Delahayes. I am generally a fan of all French Art Deco cars, but Delahayes have a flamboyance and a craftsmanship to their designs that make them unique. 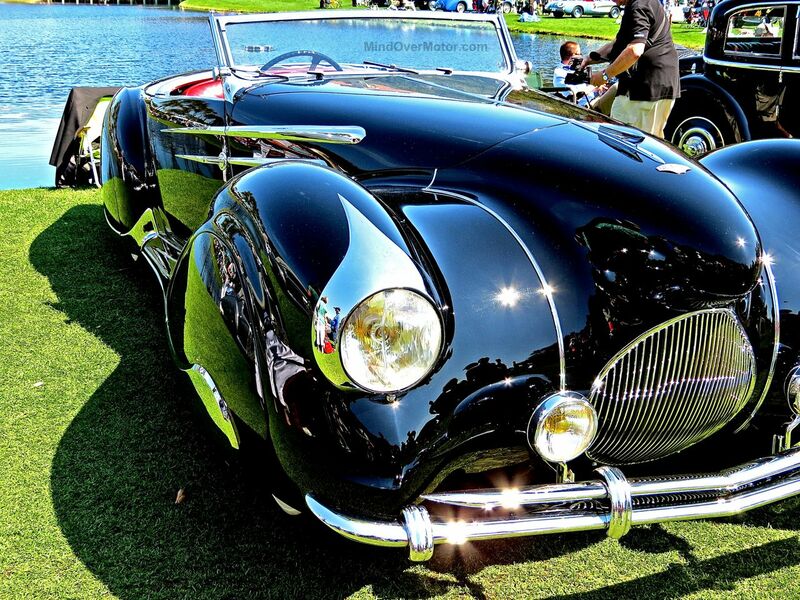 While many Delahayes come in bright, flashy colors, this 135 M Roadster Figoni et Falaschi took a different approach. It is a rich black, and looks very sinister with its swooping lines, almost like a bat. Inside the interior is fitted with red leather, and finely crafted wood. Black and red is one of my favorite color schemes on a car, so this really hit the spot for me that much more. The car itself is currently owned by J.W. Marriott Jr. (Yes, of Mariott Hotel fame), and it was fully restored in 1991. One detail that I particularly loved on this Delahaye was its hood ornament. At first glance it is a dragonfly, which would be great on its own, but looking closer, it becomes apparent that the dragonfly is actually a glider stretched over a beautiful, naked woman — Oh how French! 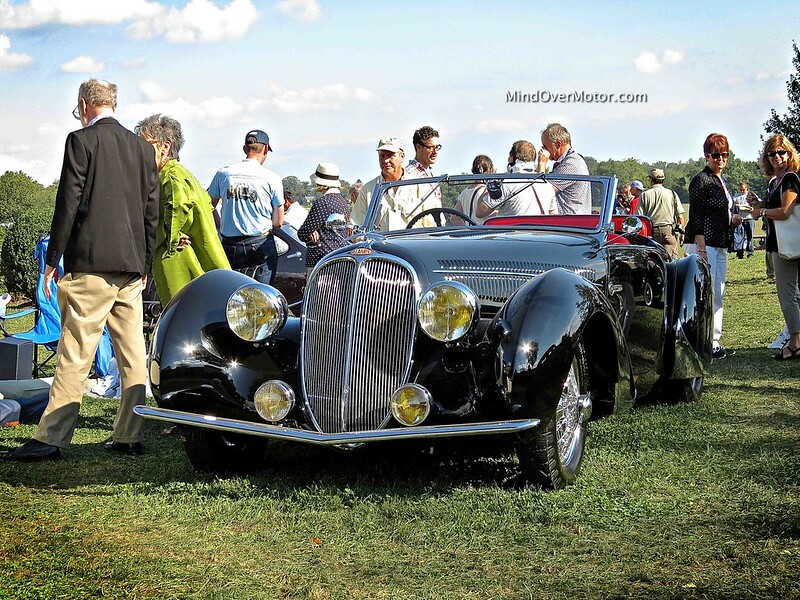 It was wonderful to see this stunning Delahaye 135M Roadster at this year’s Radnor Hunt Concours d’Elegance, and it wound up winning the “Best Open Art Deco Car” award. Enjoy the photos. 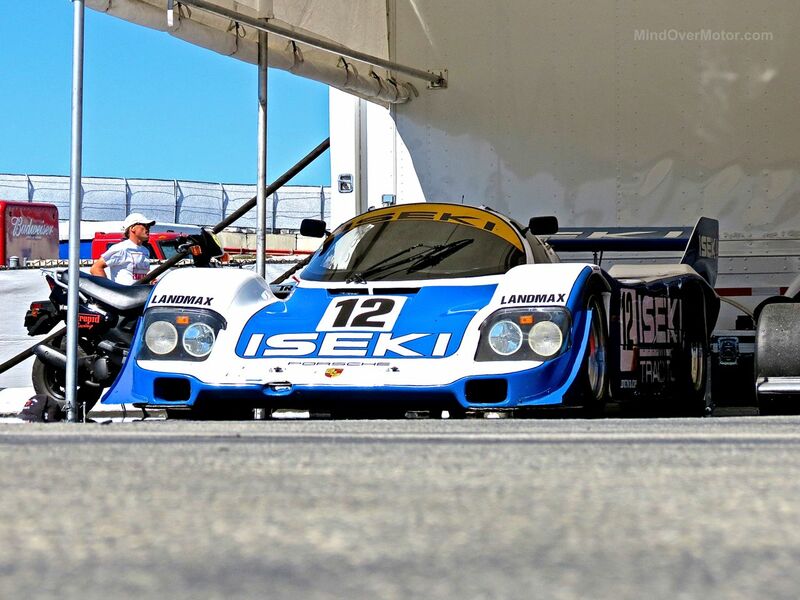 While touring the paddock of the 2013 Monterey Motorsports Reunion at Laguna Seca, we came across race car after race car. Then we rounded a corner and found this unbelievable green 1948 Delahaye 135MS Chapron Cabriolet. 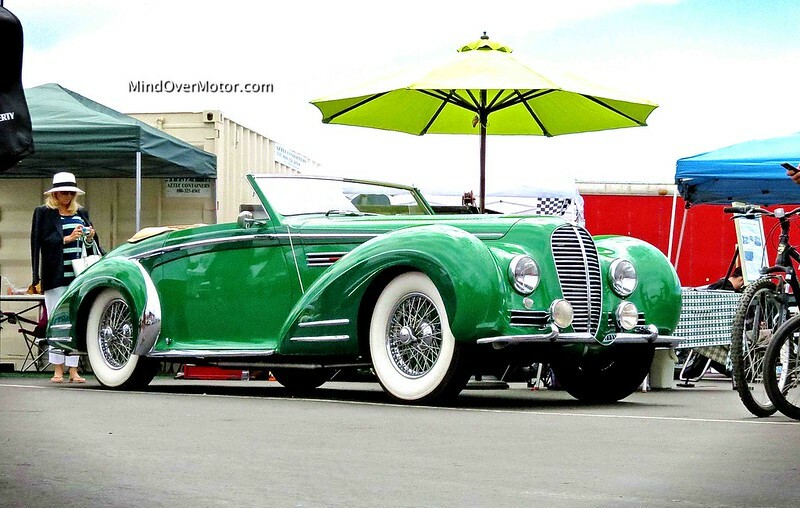 It literally “stole the show” for me with its two-tone green paint job and immaculate details. Even surrounded by some of the greatest racing cars of all time, this French masterpiece was still just breathtaking. As we poured over the car, capturing its beautiful details, the owner rolled up, fresh from a race heat, in a Bugatti Type 37. Its bare metal finish was striking, and its exposed rivets were, well, riveting. This lineup of pre-war french cars in the paddock really made my day, and they even had coordinated the color of their table cloth with the green of the Delahaye. There were so many epic racing cars in the paddock that day, but this combo of the Bugatti for the track and the Delahaye for the street was by far my favorite single bay. Enjoy the photos of these magnificent cars. 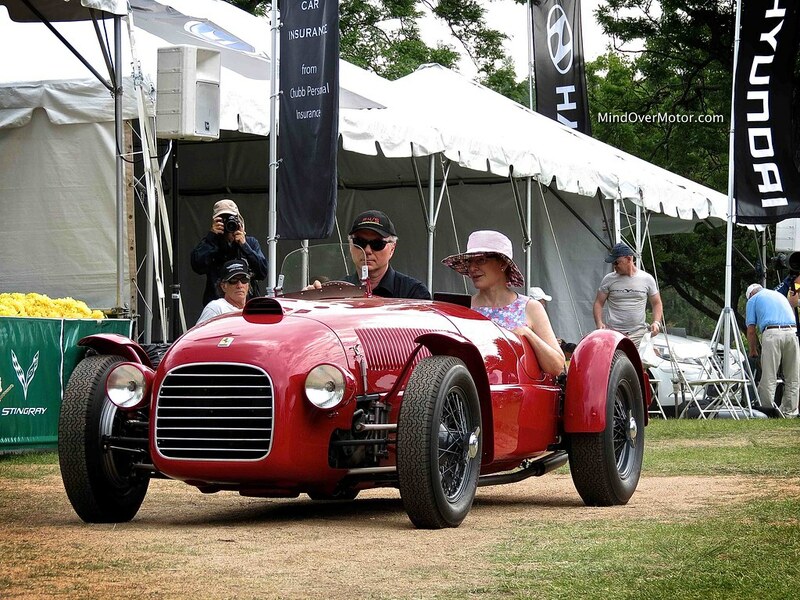 James Glickenhaus taking “Best in In Show” in his 1947 Ferrari 159S Spyder Corsa…. believed to be the oldest Ferrari automobile in existence. 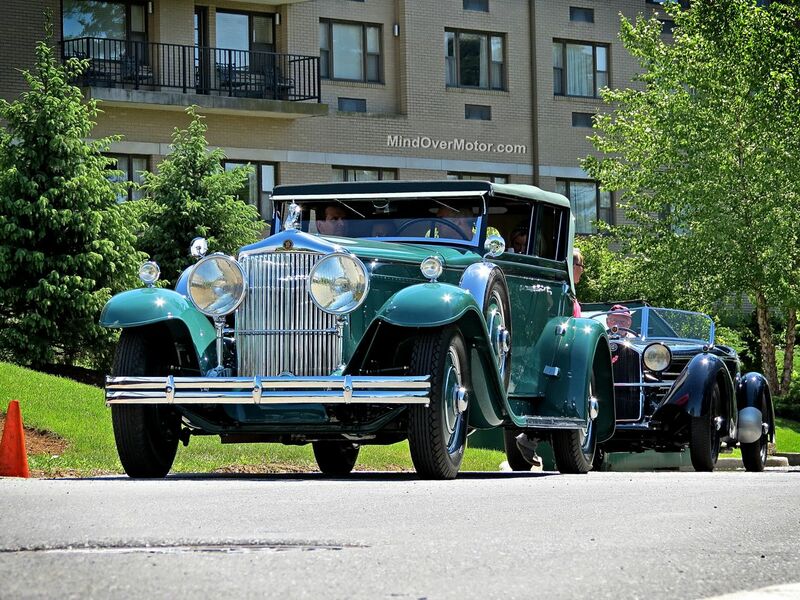 We were in attendance for the 2013 Greenwich Concours d’ Elegance this past weekend in Connecticut. It was a fantastic event, and we saw, and drove, many awesome cars. Like most Concours events we go to, we have come back with months of material that we will be sharing with you over time, but this is a highlight reel to wet your appetite. Enjoy. 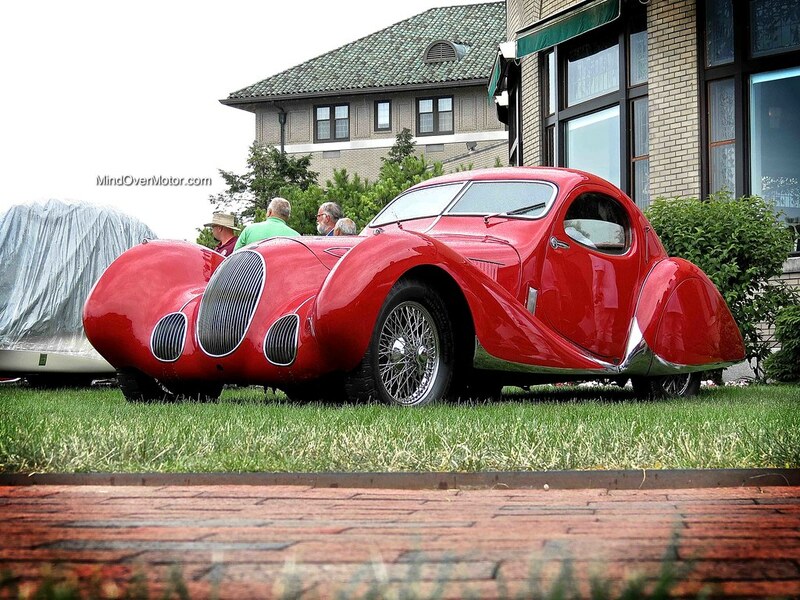 It would be a great mistake to think this Delahaye is some ordinary combination of red and black. Look a little closer and you will see a brilliant duet of raspberry and grey, accented by chrome and some of the most finely crafted wood I have ever seen on a car. I had already been through most of the show at the 2013 Amelia Island Concours d’ Elegance, but this stunning Delahaye 135 M Competition left me speachless when I found it. I saw one unbelievable car after another that day, but this was definitely my own personal “best of show”. 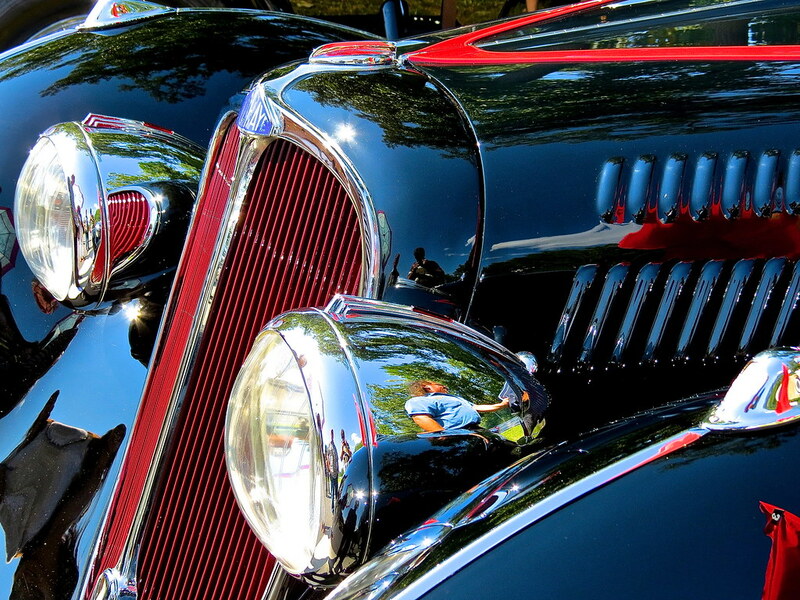 I am a huge fan of French cars from the Art Deco era, but Delahayes hold a special place for me. The richness of flavor, the swoopy designs, it all embodies exactly what I want in a car like this, and this particular 135 M is one of the finest examples I’ve ever seen. Enjoy the photo gallery of this magnificent work of art.